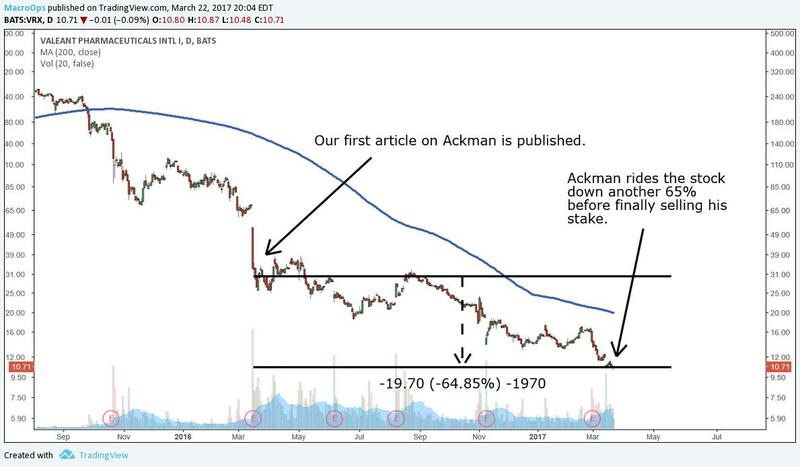 A year ago we wrote about why Bill Ackman should learn a bit of technical analysis. We weren’t suggesting he become an Elliott Wave nut or anything, but that he should adopt the risk management philosophy of a technician. TA clearly defines when to exit a trade. And with this clarity comes superb risk control — our number one job as traders. Fundamental investing relies on narratives. This is both a feature and a bug. Without a compelling narrative, other investors won’t flock to your stock and bid up prices. But narratives aren’t cut and dry like an MA crossover or trend line. This reality makes it’s hard for a portfolio manager to cut risk at the right time. Before he realizes the narrative has departed from reality, the stock could’ve already made a nasty drawdown. The key is to use narratives to initiate trades. But after the trade is on the book, let technical analysis take over and manage the risk. That’s why we’re proponents of combining different styles of investment analysis. Fundies and techs can add value. In Valeant’s case, the dominant narrative during its rise was how its CEO Michael Pearson created a new, highly profitable way to run a drug company. Instead of using gobs of money to research new drugs, just acquire old drugs and jack up their prices. This practice slashed costs, boosted revenues, and made Wall Street happy. 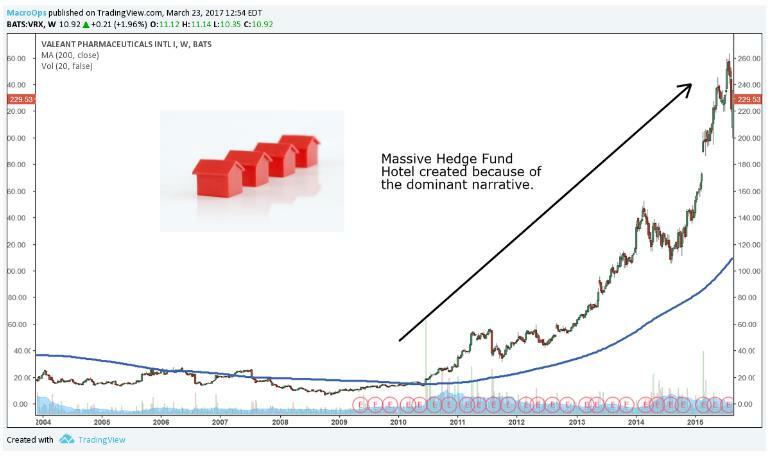 Ackman and many other hedge funds bought into this narrative and created one of the largest hedge fund hotels of all time. But eventually the narrative started to turn bearish. Skeptics argued that Valeant’s “growth” was achieved through price gouging. Then more news came out that a speciality pharmacy was in cahoots with Valeant — changing codes on doctors’ prescriptions to Valeant’s brand even when much cheaper generics were available. Valeant was basically ripping off insurance companies to juice their own sales numbers. 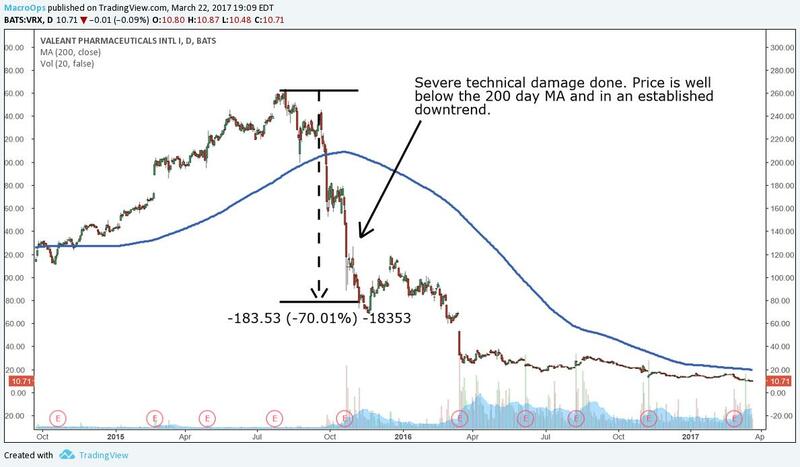 By the Fall of 2015 the stock had already fallen 70% from its highs. Here’s where technical analysis could’ve come in handy for Ackman. Technicals clearly signaled that the narrative had changed. It would’ve been easy to observe a trend break on the chart and exit. But Ackman didn’t have this risk control method in his toolbox. He was instead forced to reassess the narrative and evaluate whether or not his original thesis was still intact. This is an impossible task that requires advanced mental gymnastics. It’s too easy to get emotionally attached to a narrative and succumb to things like confirmation bias and the sunk cost fallacy. Ackman did just that as he continued to buy more Valeant. That’s why investment narratives should be used to initiate trades, not manage them. Compelling narratives create large trends which are what you need for huge gains. But technical analysis is what you need to manage your trades. It lets you objectively define your exit. If you’re relying on your interpretation of a complex narrative as an exit strategy, you’re exposing your portfolio to huge drawdowns. The reality of the market is that no matter how rich or how smart you are, you’ll eventually be wrong. The best in the business call it right a little over 50% of the time. It’s crucial to have a reliable and objective risk management process for when things go south. Without it, you’re setting yourself up to follow in Ackman’s shameful footsteps. If you want to learn how our team at Macro Ops successfully manages risk, then check out our Trading Instructional Guide here. Lessons From A Trading Great: Jim Leitner Is The Dollar About To Break?